It seems like only 18 weeks ago that I was banging on about Toontrack’s preset-toting, multiFX plug-in EZmix. I could reiterate, but in keeping with the ‘get results quick’ nature of this OS X 10.5+ PPC/Intel and Windows XP-to-7 friendly, VST/RTAS/AU, 32/64-bit instant-fairydust tool, I’ll point you to last October’s MuzoBlog post on the original EZmix. Welcome back. Now let us concentrate on the new in version 2. Most obviously, it looks rather different. The sliders are no more and instead we’ve two small and two medium-sized knobs to play with. The small ones are for controlling input and output levels, while the larger knobs’ assignations change depending on the preset loaded via a revamped menu system. And what a groovy system it is, in that it can be interrogated in a number of ways. Menus are arranged by instrument-group, instrument, effect, type and genre, as well as by any of the Toontrack preset packs, including the Producer editions on which MuzoBlog will be reporting soon. 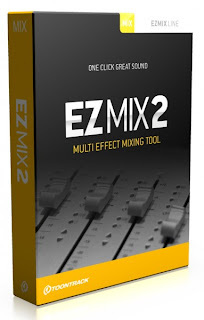 OK, that gives as good an indication as any of what to expect when stepping up to EZmix 2, a step made lighter on the wallet by an upgrade deal for v1 owners - only £28.95 via UK distributor Time+Space, or direct from Toontrack for 39 of what they call Euros, or some such. So the look is different and the price, if buying in afresh, has more than doubled, but then you do get a greater wealth of presets. However, much of Toontrack’s effort with v2 appears to have taken place under the hood. Those studying for a degree in music technology will make their lecturers less than happy if EZmix is seen on their systems. And junior mixing engineers aiming to get on will probably be keelhauled by their seniors if seen taking life EZ. In academia, as with cork-sniffing audiophilia, easy ain’t the way. There’s a ton of stuff to learn about slap-backs, soft-knee compression, hard flanging and having your ring modulated. 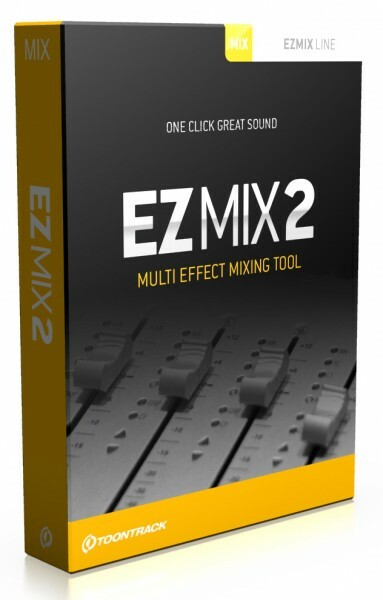 But if you’re a project studio pilot, or production professional in need of a quick fix when nobody’s looking, EZmix 2 is lunge-worthy. It won’t teach you much about the nuts and bolts of audio engineering, but it does deliver speedy, pro-sounding results without hardware or wetware meltdown. You can get more info on the detail of what it offers from both Toontrack’s and Time+Space’s product pages. And get a good impression of how EZmix 2 behaves in action by watching this vid of it. In action. Action!.. Cut! Now then, you’ve read MuzoBlog’s wisdom on the original EZmix (haven’t you). You’ve had a video walkthrough and seen v2 in all its glory, as well as bathed your ears in audio examples and consulted the developer’s and distributor’s product pages. We’re left with two Qs: At £28.95, is it worth the upgrade? And, if not upgrading but buying in, is it worth £115? The answer to the first is: Yea, verily and two-hundredfold (yes). No-brainer. You get more of the same, plus a greater variety of processors in a plug-in that hasn’t become bloated - it’s still game for capricious deployment without over-taxing a halfway decent computer system. 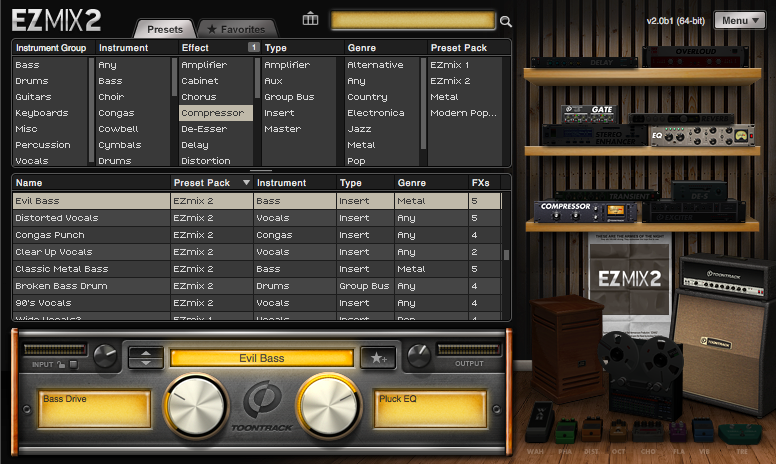 As for buying in, if you seek deep knowledge of audio-engineering lore and practice, EZmix 2 won’t teach you much. You could buy time-share in a valve-equipped volume knob for £115. Possibly. But! If your audio activities are governed by the phrase ‘get stuff done’ and the word ‘deadline’, EZmix 2 presents an ideal, time-saving, slick-sounding solution. It sloppeth over with usable presets, is to an extent tweakable and simplifies recording and mixing workflow immensely. As mentioned, it’s expandable and I’ll be posting on the range of options available forthwithly. Meantime, download the demo, as well as demo arrangements for a host of Mac and PC DAWs, and give Toontrack’s latest a twirl. Just don’t tell your lecturer or supervisor that it comes with an uninstall utility.